A new white paper from national management consulting and certified public accounting firm PYA provides healthcare organizations with guidance as they navigate the transition from volume-based to value-based reimbursement. By honestly assessing who they are and where they want to be positioned in their market, healthcare systems can pace their change to reflect the reality of their local markets and proactively manage the risk of transition. In its newest white paper, PYA (Pershing Yoakley & Associates, P.C.) delineates how healthcare organizations can implement timely and innovative strategic plans to adapt to a changing industry. The paper succinctly explores important factors for transitioning from volume- to value-based reimbursement. 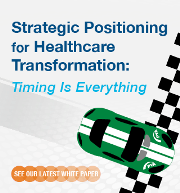 In the white paper, “Strategic Positioning for Healthcare Transformation: Timing Is Everything,” PYA provides four key considerations for healthcare organizations to keep in mind as they work toward changing strategic plans, contracting tactics, and operational structures. The paper explores factors providers must consider, such as external drivers, organizational profiles, and strategic intent. It then provides a concise framework to assist organizations as they make important decisions regarding how and when transitions from fee-for-service to value-based reimbursement occur. PYA offers extensive experience in developing and implementing tactics to assist healthcare organizations in traversing the transition from volume-based to value-based reimbursement. PYA assists with strategic planning; CIN and ACO development; board education and retreats; market and competitive assessments; payer strategy and contracting; affiliation planning assistance; and service demand and financial assessment. PYA’s steadfast commitment to an unwavering client-centric culture has served the firm’s clients well. PYA is now ranked by Modern Healthcare as the nation’s 9th largest privately owned healthcare consulting firm. PYA affiliate companies offer world-class data analytics, professional real estate development and advisory resources for healthcare providers, comprehensive claims audits for self-insured Fortune 500 companies, wealth management and retirement plan administration, and business transitions consulting.